Even if this is all doctored, which I don’t think is the case, these stunts are very entertaining…amazing what people can do…even if it took them hundreds of tries to succeed! 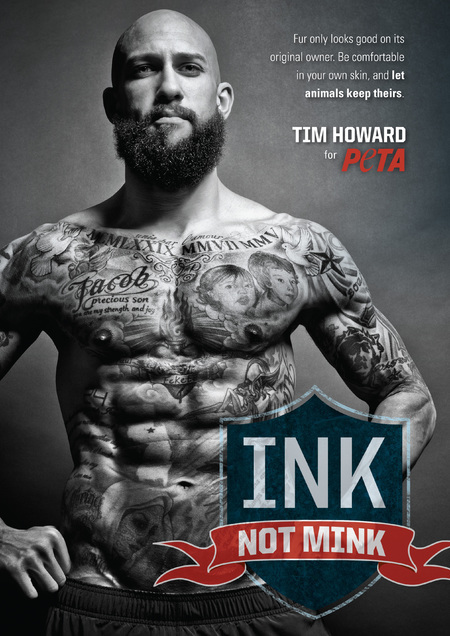 Tim Howard, a star goalkeeper for Everton and the US international soccer teams, was chosen by charity PETA to front their new “Ink not Mink” campaign. Clever headline. Look at those abs and other muscles bulging out of those incredible tattoos. Howard was Man of the Match twice in the 2014 FIFA World Cup Games. PETA stands for People for the Ethical Treatment of Animals. “Protecting animals is very important to me, and I think speaking out against fur is an amazing cause”, Tim said. Tim has a reputation for playing through pain. In September 2007 he accepted a call-up from the United States for a friendly against Brazil, and after an hour of the game his finger was dislocated in a collision. In March 2013, during an FA Cup game against Oldham Athletic he broke two bones in his back. In both incidents, he continued playing until the final whistle. Makes mentioning my little aches definitely embarrassing. Meet Nico Calabria, a senior at Concord-Carlisle High School in Massachusetts who was born with one leg. But despite only having a left leg, Calabria is co-captain of the school’s junior varsity soccer team along with the varsity wrestling team. In a game against Newton South, Calabria scored one of Concord’s nine goals with an amazing volley that would have been difficult for every player on the field. Concord-Carlisle was given a corner kick and Calabria stationed himself on crutches by the far post just outside the box. The ball sailed past the goal where Calabria planted his crutches, turned his body and connected with a scissor-kick to put the ball in the back of the net. But if you think that highlight is amazing, you should probably check out the documentary called “Nico’s Challenge,” a story about how Calabria climbed Mount Kilimanjaro at age 13. Kilimanjaro. 13 years old. 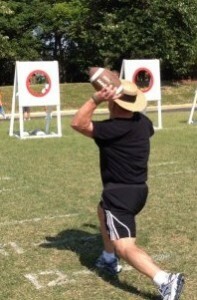 One leg. In 2007, he went on Ellen DeGeneres’ talk show and explained that he climbed the mountain to raise money for kids in Africa who need wheelchairs. What impresses me most in this story (see boldface type below) by Martin Rogers is how when this world famous athlete was a young boy just getting started with a potentially crippling illness, he ignored doctors’ urgings to quit and played through his pain. I so admire this passion and determination. It’s among the noble traits of humans that deserve to be celebrated. And can you believe that these kids are just eight years old, when they trial for world class teams? 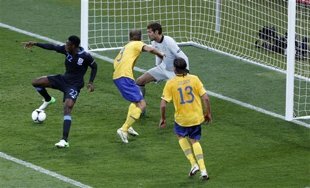 Danny Welbeck produced the most unusual and imaginative goal of Euro 2012 (European football) to hand England a desperately needed victory over Sweden on Friday and provide the highest point in a career that itself is a triumph against long odds. Welbeck completed a dramatic comeback for England with the final goal in a 3-2 win in Kiev and leave his country needing just a draw against co-host Ukraine in its final match in Group D to guarantee a place in the quarterfinals. The 21 year-old Manchester United striker had his back to the goal when Theo Walcott fired in a low cross from the right after 78 minutes, but he was able to flick the ball with the back of his right heel, sending it past Sweden goalkeeper Andreas Isaksson and into the net. It was Welbeck’s second goal for his country, and some fans had expressed doubts as to his suitability for a starting place in the absence of suspended first-choice forward Wayne Rooney. However, Welbeck is no stranger to overcoming adversity, having battled an unusual and debilitating condition as a child as well as being told he had no chance of becoming a professional. Welbeck was diagnosed with Osgood-Schlatter disease in his formative years, leaving him with excruciating pain and swelling in his knees. Doctors warned he should consider quitting soccer, claiming that continuing to train and play several times a week could cause ongoing pain and growth complications. The youngster refused to give up on his dream of becoming a star, though, and regularly told his parents and coaches that the pain he felt was less serious than it really was. Finally, toward his late teenage years, the problem disappeared. It has never returned. That was not the only hurdle he had to overcome. This might make uncomfortable reading for some Manchester City supporters, but United’s hated rival missed out on the opportunity to snap up Welbeck long before he eventually became a star. Welbeck was part of City’s youth training program as a youngster but was not considered to have the potential to become a professional and was told not to return for future training sessions. A few months later, Welbeck was spotted by a United scout, and the rest is history. Free style soccer appears to be juggling a soccer ball with your feet and body. Indi Cowie is thought to be the best female free styler in the world. She is just 16. Here is an article about her story and skills. And here are some excerpts from the article. She practices for at least 90 minutes a day and wears through a pair of specialized freestyling sneakers every month. The family garage is her laboratory, where she practices. I interviewed an upcoming soccer star today. He’s been playing since third grade in Cleveland, Ohio and has risen to regional and now national prominence. “I used to be timid and afraid of the ball. I changed by playing soccer,” explained Gonzalo Villafan proudly. I should mention he is only 10 years old and the animated beneficiary of an America SCORES after school program that uses sports—specifically soccer—to reach out to kids in low income neighborhoods. He wrote about the Balloon Boy fraud and recited his poem in front of 600 people back home. “They stood up on their seats and clapped and shouted.” Gonzalo was one of two youths chosen to represent Cleveland in the national recital. When is the last time you were brave enough to talk to a group that large? Today he was in New York for the first time to be in a poetry slam at the auditorium of the New York Stock Exchange. He was in a group of 30 kids from around the country who rang the closing bell, met members of the New York Red Bulls soccer team, some other professional league soccer players, team owners and even Sunil Gulati, the president of the US Soccer Federation. This all reminded me of a photographer I knew, Ben Fernandez, who taught ghetto kids how to take pictures to push them away from drugs, away from negative influences and thinking positively for themselves. It increased their self-esteem and gave them the confidence to try for more achievements. Angel Franco, became a Pulitzer Prize winning photojournalist. Fung Lam went to Harvard and became a doctor. Ben went on to found the New School’s photography program.